Two For One: Groupon Replaces CEO Mason With Board Members : The Two-Way Groupon co-founder Andrew Mason has been fired as the daily-deal company's CEO, one day after Groupon posted financial results that showed it lost $67.4 million during 2012. Board chairmen Eric Lefkofsky and Ted Leonsis will jointly fill the CEO post on an interim basis. 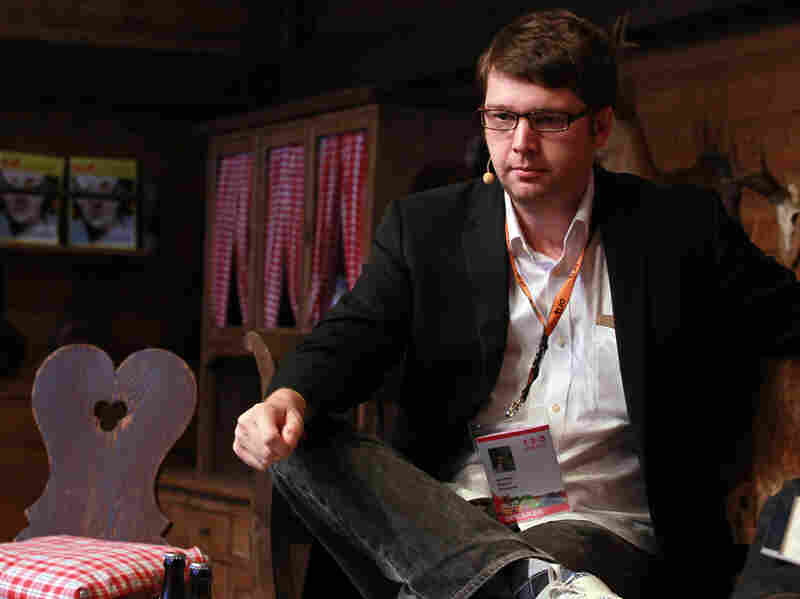 Andrew Mason, a co-founder of Groupon, has been ousted by the company's board, one day after a disappointing earnings report. Here, he's seen at a 2012 conference in Germany. Hear Laura Sydell's report for Morning Edition by clicking the audio link. Groupon co-founder Andrew Mason has been fired as the daily-deal company's CEO, one day after Groupon posted financial results that showed it lost $67.4 million during 2012. Board chairmen Eric Lefkofsky and Ted Leonsis will jointly fill the CEO post on an interim basis. Shares in Groupon sank by nearly 25 percent to $4.53 at the end of trading hours Thursday, as investors digested the news of another losing quarter and a financial outlook that predicted first-quarter 2013 revenue would fall short of analysts' estimates by tens of millions of dollars. "After four and a half intense and wonderful years as CEO of Groupon, I've decided that I'd like to spend more time with my family. Just kidding - I was fired today. If you're wondering why... you haven't been paying attention." Mason, well-known for his open and joking personality, later compared his tenure at the company to a charmed session of playing the video game Battletoads. And he asked for suggestions for "a good fat camp to lose my Groupon 40" — a request he later said had met with sufficient responses, via his Twitter feed. The daily coupon business, seen just years ago as a sector of expansion and fast-growing profits, has struggled recently, due to international volatility and a slide in popularity for daily discounts. Last month, LivingSocial, a smaller rival to Groupon, announced that it lost $650 million in 2012. LivingSocial received a cash infusion of $110 million last week. Groupon has also come under pressure from Google, which famously attempted to purchase the company for nearly $6 billion back in 2010. Announcing the change, Lefkofsky said, "I want to thank Andrew for his leadership, his creativity and his deep loyalty to Groupon. As a founder, Andrew helped invent the daily deals space, leading Groupon to become one of the fastest growing companies in history." Groupon's board says it will conduct a search for a new CEO.